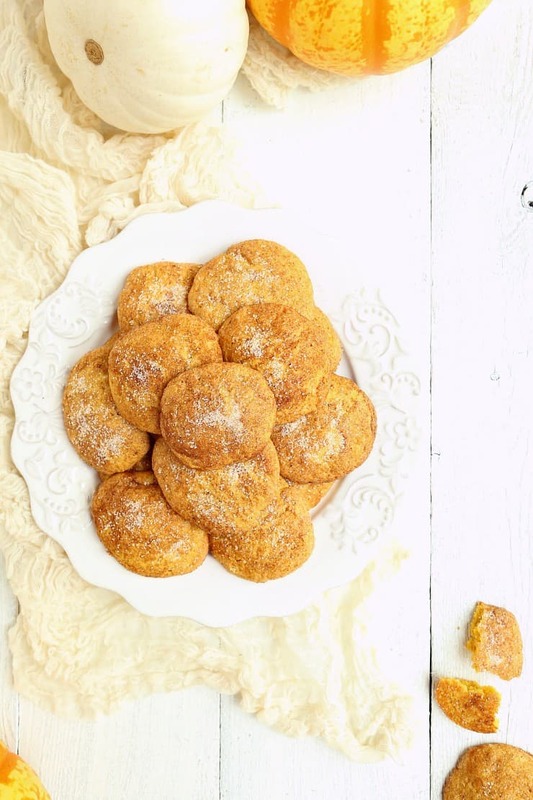 These amazing, fall inspired pumpkin snickerdoodles have become a family favorite at my house and they get glowing reviews every time I take them somewhere too! They’re super easy to make, dairy free, and use ancient grain Einkorn flour. 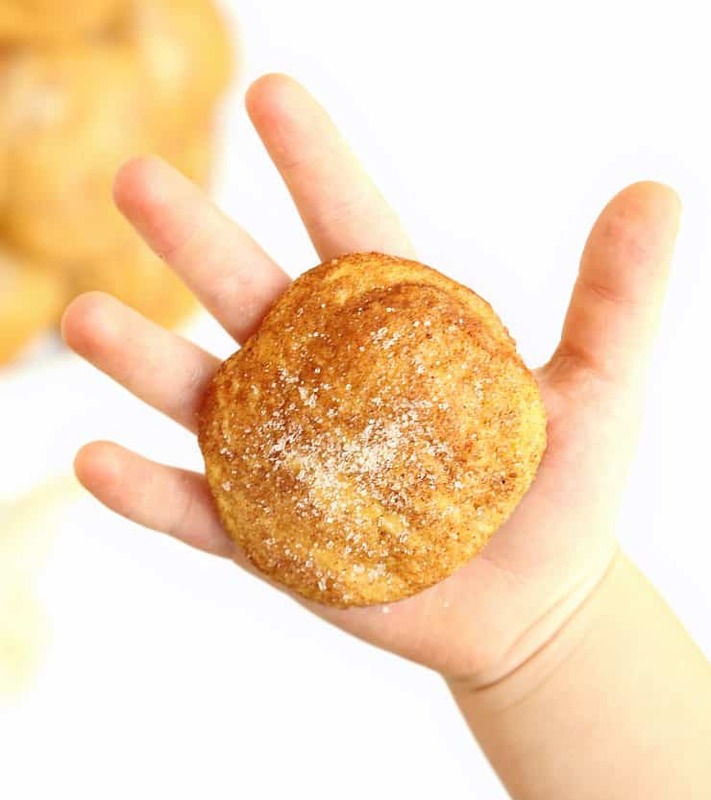 Snickerdoodles are a favorite at our house. We have a family recipe that can be thrown together in minutes and has the greatest texture of any snickerdoodle cookie EVER. Really. A while back, I decided to give the tried and true a health-lift and a fall makeover. Dabbling with a family favorite is a risk, but this time it was worth it! They’re healthier – I used ancient grain Einkorn flour, swapped the Crisco for coconut oil, replaced some of the sugar with maple syrup, and added pumpkin…who doesn’t love a dessert with vegetable value? 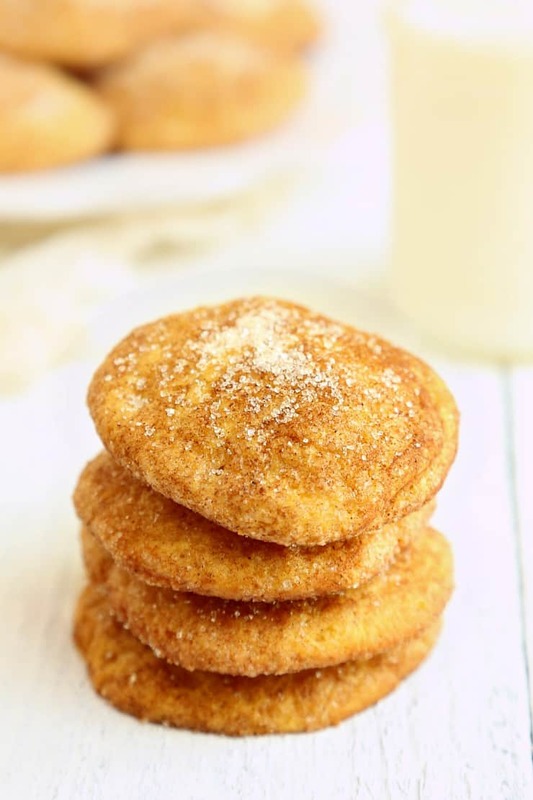 They still have that amazing snickerdoodle texture – They’re slightly crisp on the outside and a soft and fluffy inside. Warning – if you make these, you will need one hand devoted to fending off cookie snatchers! These cookies are pretty straightforward, but you do want to keep a few things in mind about the coconut oil and about storing them. You MUST measure the coconut oil in the soft-solid state If you measure in the liquid state or use too much, the batter will be too wet to form balls. If this is the case, refrigerate the batter for 10-15 minutes to allow it to firm up a bit. Alternatively, additional flour could be added to thicken the batter, but will result in a cookie that is slightly more dense (though still amazingly good!). Measure exactly 1 level cup of coconut oil. If you’re familiar with baking with coconut oil, you know that even a little bit extra can result in cookies that are too soft and spread too much. These will spread somewhat when baked so make sure and leave plenty of space between them on the pan. These keep well for a few days and will soften over time. If you want to crisp them up again, place a few on a cookie sheet in a 300 degree oven for just a few minutes. Ancient grain Einkorn flour is my default flour for baking, but you can substitute regular all purpose flour too. 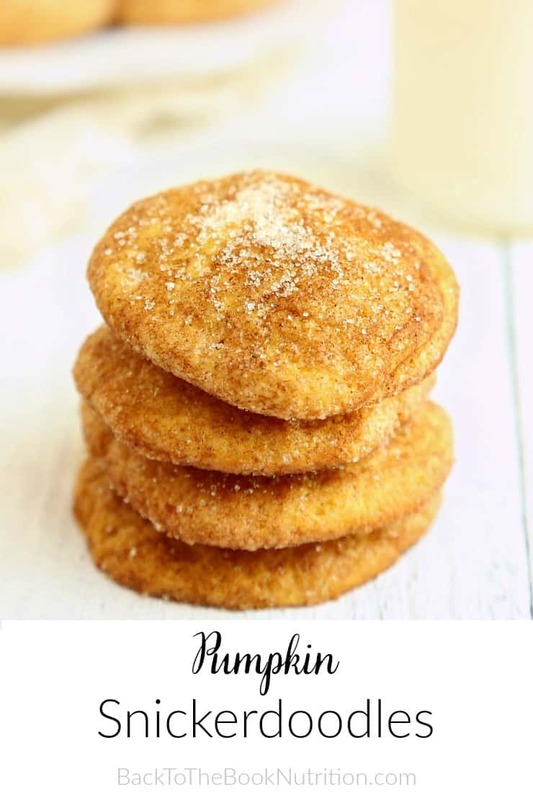 These amazing, fall inspired pumpkin snickerdoodles have become a family favorite at my house and they get glowing reviews every time I take them somewhere too! They're super easy to make, dairy free, and use ancient grain Einkorn flour. In a large bowl, cream oil, sugar and maple syrup. 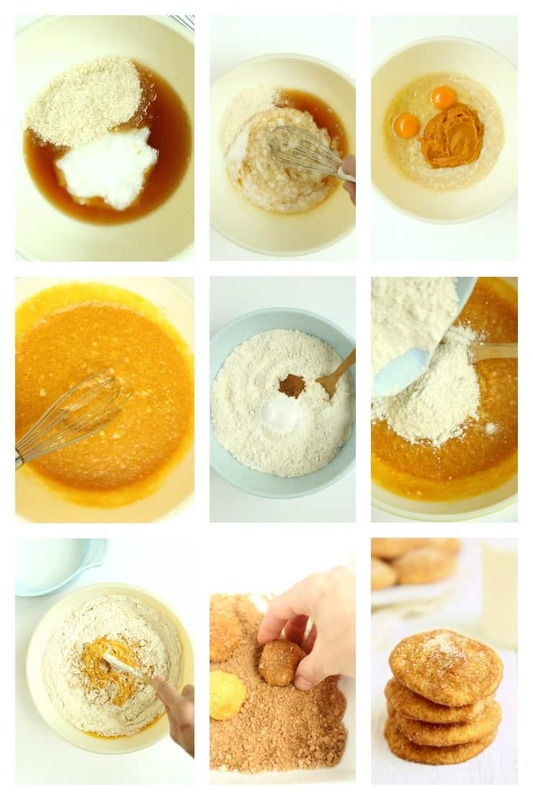 In a separate bowl, stir together flour, baking powder, salt, and pumpkin pie spice. Gently stir dry mixture into wet until thoroughly combined. Roll into 1" balls (can use mini ice cream scoop to ensure balls are equal in size), then drop the balls into a bowl with sugar-cinnamon-pumpkin pie spice topping and use hands to gently coat all sides of the balls with the mixture. Place coated balls on cookie sheet. These will spread, so limit to 12 per cookie sheet. Bake for approximately 10 minutes, or until surface begins to crack slightly. Measure exactly 1 level cup of coconut oil. If you're familiar with baking with coconut oil, you know that even a little bit extra can result in cookies that are too soft and spread too much. If you make these, tag @backtothebooknutrition on Instagram or Facebook! Do you think swapping some applesauce for the coconut oil would work? I don’t have a full cup left & would love to make these! yum and yum! I love to cook! I love to bake as well, but making the perfect muffin has seemed to be my nemesis….. until now! I love that these muffins come out like cake donuts (think crumb donut texture) My only mistake this time was that at 10 mins, they were still so wet on the inside that I set the timer for 3 mins more. I should’ve done maybe 11/2, BUT I was still happy with the flavor and texture despite having to cut off the burnt bottoms:) Thanks for sharing! 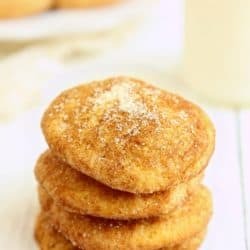 I’ve never actually made snickerdoodles but I think these sound like where I’d want to start being that bit healthier and they look great too! Thanks for providing such detailed instructions. I would have almost measured the coconut oil the wrong way. Yum! This definitely does sound perfect for fall. I love how you made them with Einkorn flour. I simply LOVE snickerdoodles! These look so delicious and perfect for Thanksgiving!